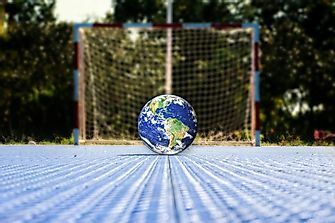 The flag of Kazakhstan was officially adopted on June 4, 1992. 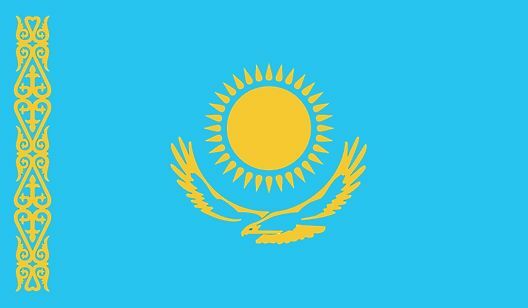 After seceding from the former Soviet Union (USSR), Kazakhstan hoisted its former flag, a rectangular breadth of blue color with the sun in its center surrounded by 32 beams, and a steppe eagle soaring beneath. The hoist side features a vertical strip with a national ornamental pattern with images of the sun, beams, eagle and ornament - are gold-colored. 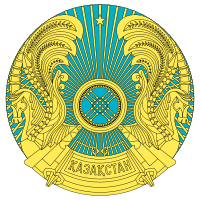 Adopted on June 4, 1992, the emblem of Kazakhstan is composed of a shanyrak (the image of the upper dome-like portion of a yurt) centered, and two mythical horses against a blue background. The shanyrak is a symbol of well-being of family, peace, and calmness, while the circular shape represents life and eternity.